Ladies Rock MKE is an intensive Friday-Sunday music camp in Milwaukee, WI, for women, transgender and gender non-conforming folks of any identity 18 years or older. Campers of all skill levels learn an instrument (typically guitar, bass, drums, keyboards, or vocals), form a band, write a song, and perform their song at an end-of-camp showcase for friends, family, and fans. During camp, campers receive small-group instruction on instruments, attend workshops, and practice with their bands. Workshops focus on topics such as songwriting, conflict resolution, women in rock, band merchandising/marketing, and others emphasizing leadership and the skills women need to take over the world! 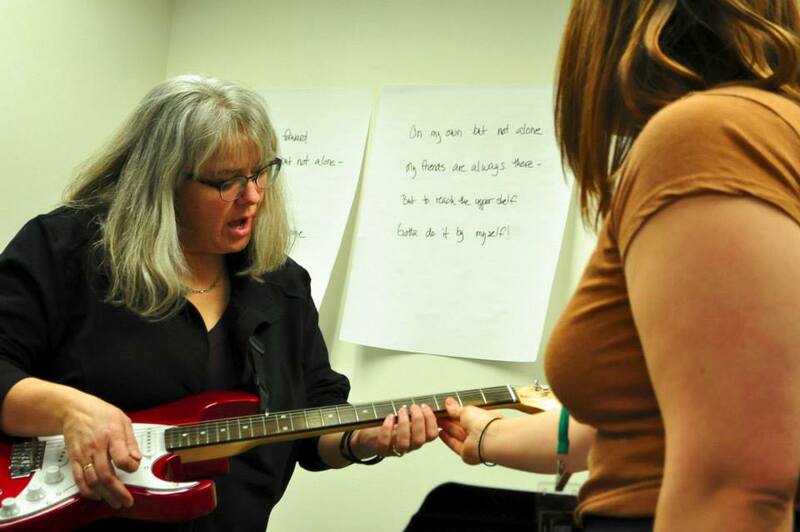 Instrument instruction and workshops are taught by an all-volunteer staff of Milwaukee-area musicians, teachers, artists, crafters, business owners, and community organizers. No musical experience is required! You do not have to bring your own instrument, although you are welcome to do so. We will provide instruments and equipment during camp. In the application, you must pick two different instruments you would be interested in playing in your band. The choices are bass, drums, guitar, keyboards, or vocals. If you prefer to play another instrument, such as the ukulele, cello, or tambourine, that is fine, too, but you will be responsible for bringing it to camp. We do our best to accommodate all participants with the instrument they would like to play at camp while making sure we have a balance of vocals and instruments in each band. Camp is held from 8:30am-5:30pm on Friday and Saturday at the Helene Zelazo Center on the campus of University of Wisconsin-Milwaukee. Sunday workshops and Showcase are held at Miramar Theater. Campers must be able to attend all days of the camp, as well as the Showcase. Workshops offered during the 2018 camp included handling your gear, how to write a song and tell your story, rocking out on stage, soundchecking, & shameless self promotion. Specific workshops that will be offered during the 2019 camp will be announced soon. In addition, campers will be treated to private performances from some of our favorite local lady rockers! Camp tuition is $250. Financial assistance and payment plans are both available to allow any rocker the opportunity to attend camp. Learn more about the registration and payment process here.